At mete and drynke watz sche. “Whoso ys here þis ilke stounde? Þe milke has com þis daye. For he bryngys nat to-daye. Forsooth, he has hys kai. So þe tygre did sitte at borde. Þe tygre eten al þe horde. Moþir ȝaf hym milke and drynke. Þe moþir saide “O wailawaye! Þer was no water forto scrubbe. Þe tygre was to blame. (þai boȝte som fude for þir frende). 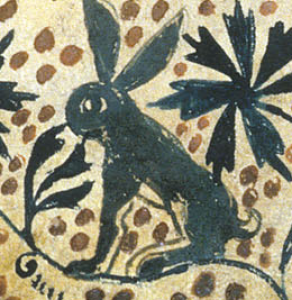 Detail from London, British Library, Sloane MS 3544, f. 2.